Preparations for a royal visit are underway at Trearddur Bay lifeboat station as Royal National Lifeboat Institution (RNLI) volunteer crew, fundraisers and supporters in the Anglesey village get ready to welcome HRH Prince William of Wales and Kate Middleton. The royal couple will be guests of honour at the naming ceremony of the RNLI lifeboat station’s new Atlantic 85 inshore lifeboat, Hereford Endeavour, on Thursday 24 February. During the engagement Prince William and Miss Middleton will meet the charity’s volunteers and name the new lifeboat. The Hereford Endeavour will be launched during the ceremony as the crew demonstrate some of her rescue capabilities to the royal party and station guests. The lifeboat station at Trearddur Bay was first opened in 1967. Since then, RNLI volunteers have launched the lifeboat 873 times and saved 202 lives. In 1971, Helmsman John Burns and Crew Member Edmund Williams were awarded the RNLI’s Bronze Medal for rescuing two people from a capsized dinghy in treacherous sea conditions. The Atlantic 85 is the most advanced inshore lifeboat produced by the RNLI. She can reach speeds of up to 35 knots and is fitted with a radar system, radio direction finding equipment and a sophisticated chart plotter to aid search and rescue operations, particularly in low visibility. She will also be able to carry more casualties than her predecessor. The RNLI is an independent charity, which relies on public donations in the United Kingdom and Republic of Ireland. 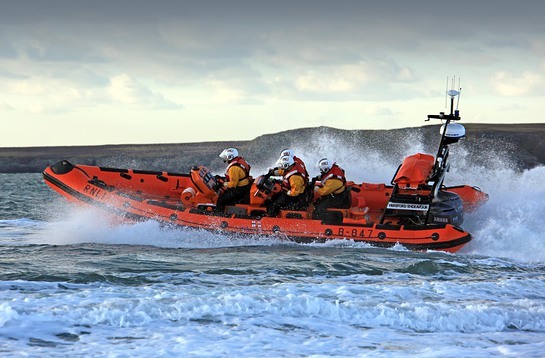 Trearddur Bay’s new Atlantic 85 is the latest in a long tradition of lifeboats funded by the hard work of fundraisers and the generosity of the public. Hereford Endeavour was funded by the local RNLI fundraising branch in Leominster and other fundraising branches across Herefordshire. Before the lifeboat was delivered to her new station, she made a special visit to Hereford Cathedral so that the members of Leominster branch could see the result of their hard work.